Is It Too Early For Back-To-School Sales? Public school students in Union City, NJ, just wrapped up classes earlier this week. So Consumerist reader Juhgail was caught off guard when she popped into a Staples to pick up some supplies and came upon an entire rack of back-to-school items. “I almost FELL OVER when I saw this display in the main aisle at the front of the store!” she writes. NYC public schools are still in session until next Monday and I know if I were a teen and saw a display like this, I’d be supremely depressed. What do you think? Is this a case of back-to-school creep? 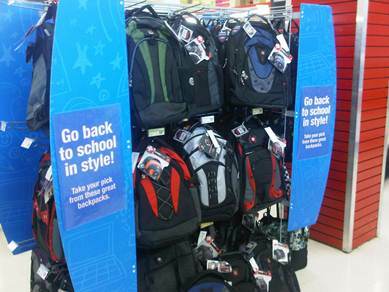 And how early should stores start pushing back-to-school deals?